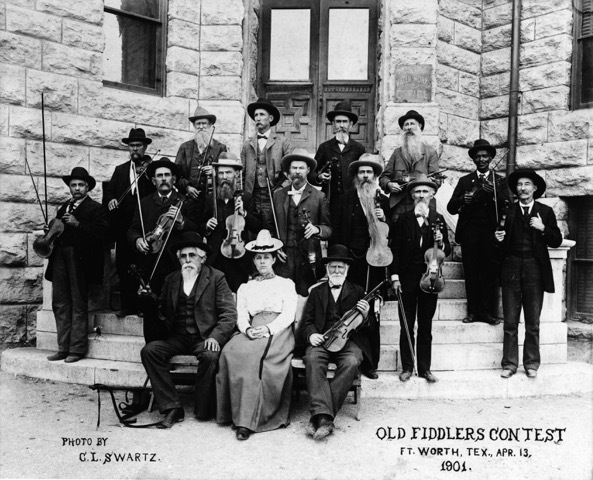 The Old Fiddlers Contest was held at Fort Worth City Hall on April 12-13, 1901. Sponsored by the Robert E. Lee Camp, United Confederate Veterans, the contest featured participants from across north Texas who had been playing the fiddle for 25 to 60 years. Fort Worth photographer Charles L. Swartz assembled the group on the steps of City Hall to commemorate the occasion. Henry C. Gilliland (Parker County) won first prize, a gold watch, plus best “Dixie” and best “Arkansaw (sic) Traveler.” J.K.P. Harris (Granbury) won a silver watch for second prize and was deemed the most handsome. Third prize, a suit of clothes, went to Ed L. Taylor (Weatherford). Additional prizes went to: O.P Simms (84, Plano) the oldest and whitest hair; M.J. or W.J. Bonner (Fort Worth), smallest foot and shortest; J.J. Roberts (Springtown), tallest; T.A. Furlough (Hood County), largest foot and ugliest; W.J. Winniford ( Lancaster), one-eyed; Dr. H.R. Gray (Kaufman County), oldest violin and longest beard; John A. Young (Paris), bald-headed and best rebel yell; and Steve S. Atkins, the second bald-headed prize. Other contestants were T.C. Adams (Fort Worth), J.M. Ginn (Navarro County), J.C. Miller (Tarrant County), and J.E. Ross (Lindale).